Healthy Nut Factory of Bayside, N.Y., is recalling 7-oz. pouches of Organic Coconut Smiles that may be contaminated with Salmonella. The recalled product, packaged in green rice paper pouches, with UPC Code: 8 13449 02099 3 and the expiration date 6/1/2018 on the back of the pouch, was sold at retail stores in New York City and Long Island. Customers who purchased the recalled product from August 22, 2017, through November 20, 2017, should return unused product to the store where it was purchased for a full refund. 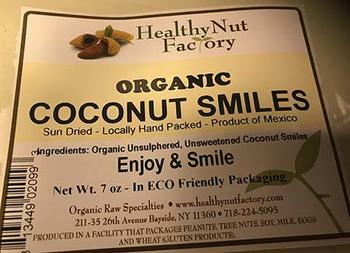 Consumers with questions may contact Healthy Nut Factory at 718-224-5096 Monday – Friday 9:30 am – 4:00pm, or by email at info@healthynutfactory.com.